A recent national report conducted by the Office of National Statistics (ONS) has revealed that wages are increasing at a slower rate than inflation for the first time since 2014. Right now, the average salary has increased by 2.1% in the three months to March; however, inflation is up 2.3% over the same time period, creating a differential of -0.2%. 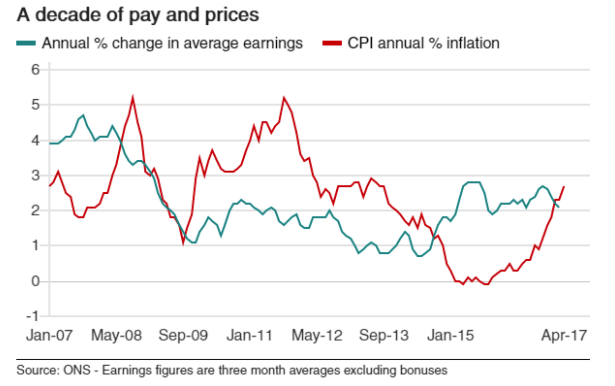 Simply put, the average cost of living is currently rising at a faster rate than real wages, which means that people now have less disposable income after paying for their weekly and monthly essentials. Experts say that the current trend can be attributed to the longer term impact of Brexit on UK households and their total budget. Unemployment lower than ever – but is it all good news? Also this week, the ONS announced findings that the UK unemployment rate was the lowest it’s been for 42 years. Currently, there are approximately 31.95 million people in work, which works out to around 75% of 16 to 64-year olds. It’s clear that Britain’s businesses are now hiring more employees than at any other point in recent memory; the problem is that the average job cannot be considered ‘well-paid’ in the context of our current cost of living. Again, the general thought among economists is that this trend is only temporary, and it won’t be long before real wages start rising in line with the demand for employment.